Winter on the Beach? 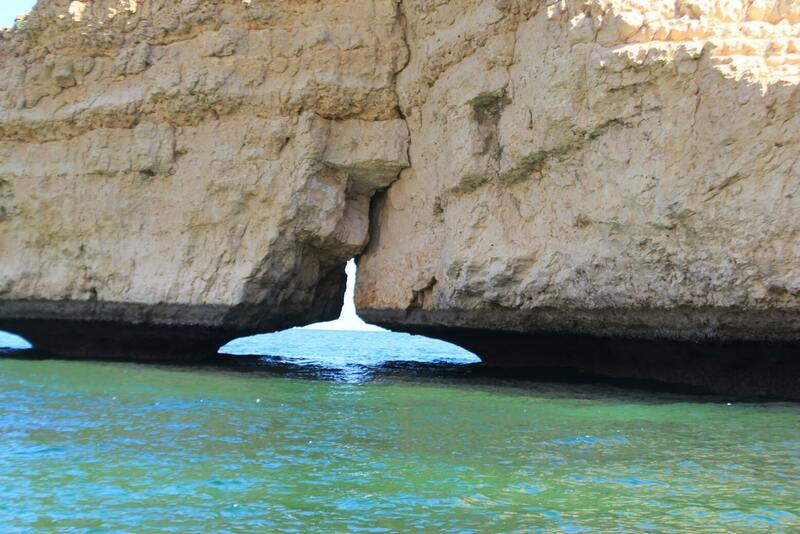 Oman will surprise and delight. That’s right. 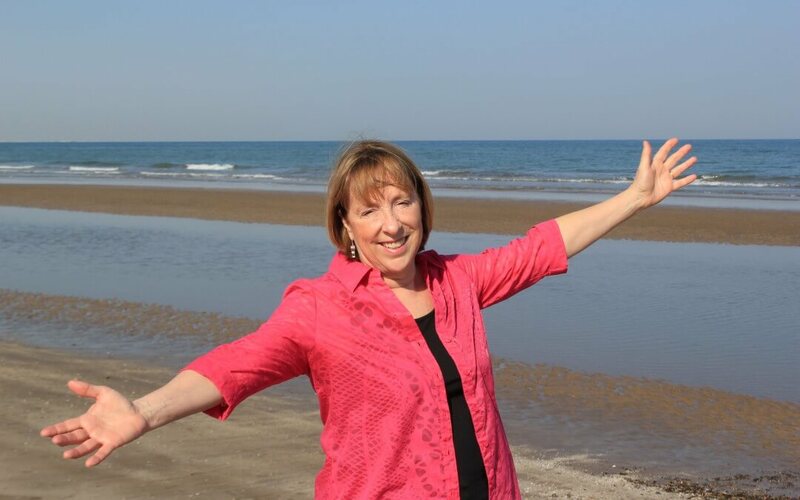 I’m recommending a beach vacation in the Middle East. Who would do that? 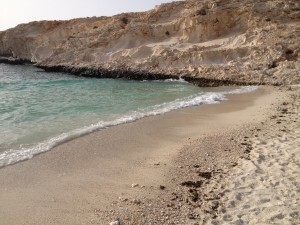 Well thousands of Europeans have already discovered Oman’s sun-drenched paradise.Last week I blogged on places like the desert and now below on how to relax at the beach. But what about bathing suits? Middle Eastern women cover. Won’t people stare at me—or worse? Not in Oman. Omanis are tolerant and accepting, for one. 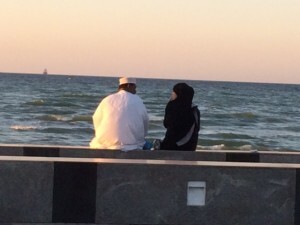 Also, Westerners go to the beach during the day; Omanis go in the evening. 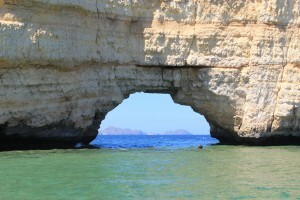 If you’re really nervous, find a secluded cove or check into a resort with a private beach. 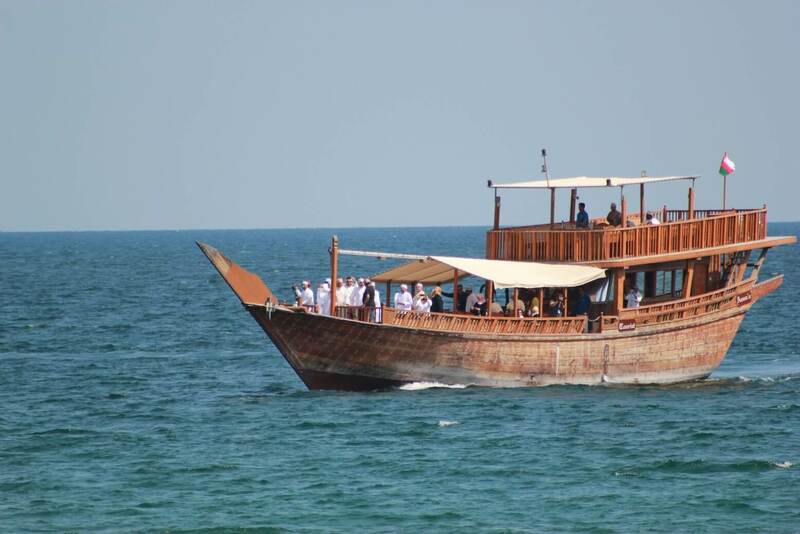 Oman’s seashore offers a wide variety of activities. 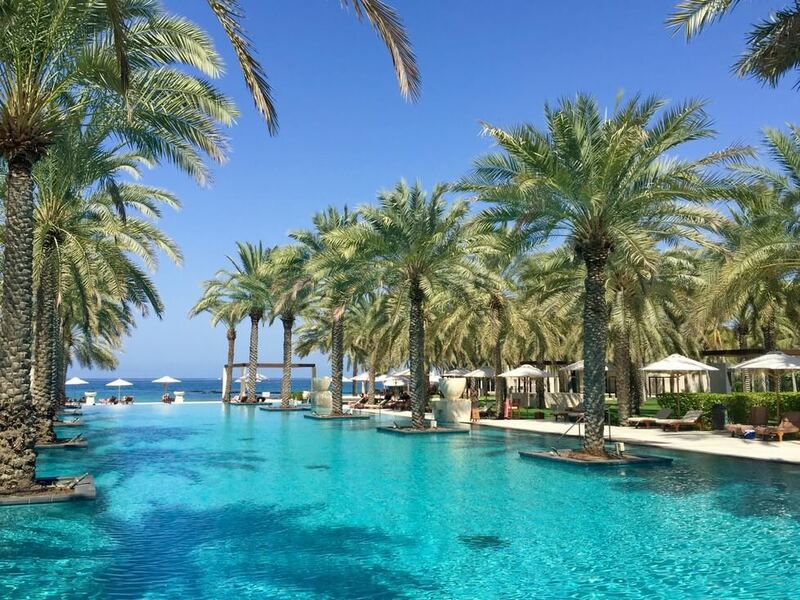 The cool thing is that Oman’s over 1200 miles of coastline with crystal-clear water and groomed sand offer a lot more to do than swim. 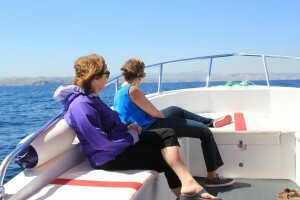 Find a cafe for a leisurely lunch of prawns, lobster or Indian food, or just stop in a coffee shop with a great view. You can do Starbucks or Arabian Coffee. Lots of options here at Shatti Beach. 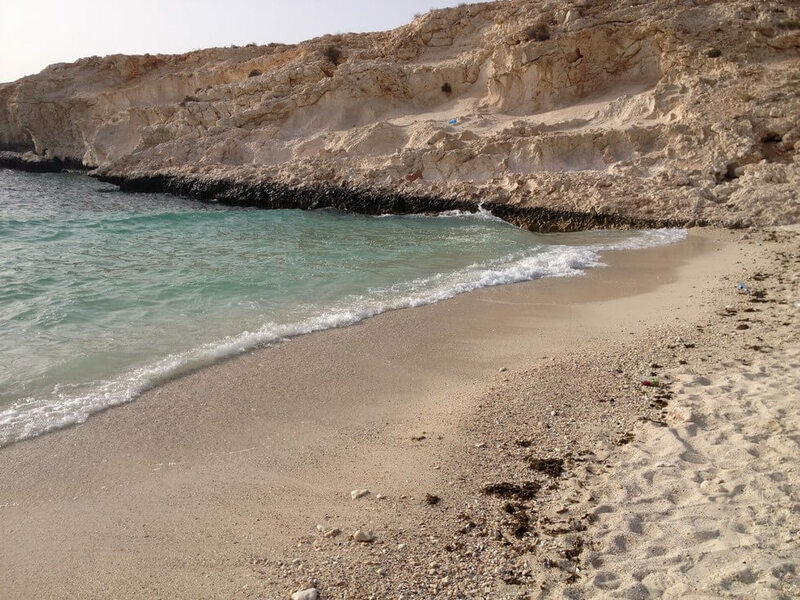 Set up your beach chairs or blankets in a quiet cove along the coast of Muscat and enjoy snorkeling or beach combing for shells. 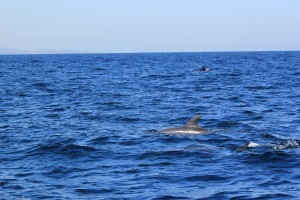 Scuba diving is also a growing attraction for Oman. Muscat beaches are real—not touristy—because the Omani’s love them, too. And Westerners can meander among the locals without any discomfort whatsoever. One evening we drove (crept, really) down Lover’s Lane, a narrow isthmus flanked by the sea and a mangrove forest. 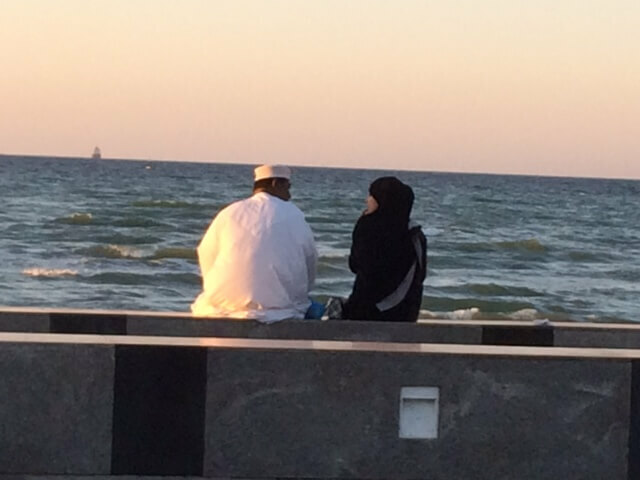 Here, Omanis meet on the beach, stroll the walkway above, or crowd into the three large coffee shops, which, surprising to me, are empty in the morning but packed at night. So goes life in a culture without bars. Another evening we, along with hundreds of other people, lined the beach by the Hyatt Hotel to watch the many soccer matches going on after five o’clock. Oman’s dramatic coastline stretches from the Arabian Sea to the Indian Ocean. 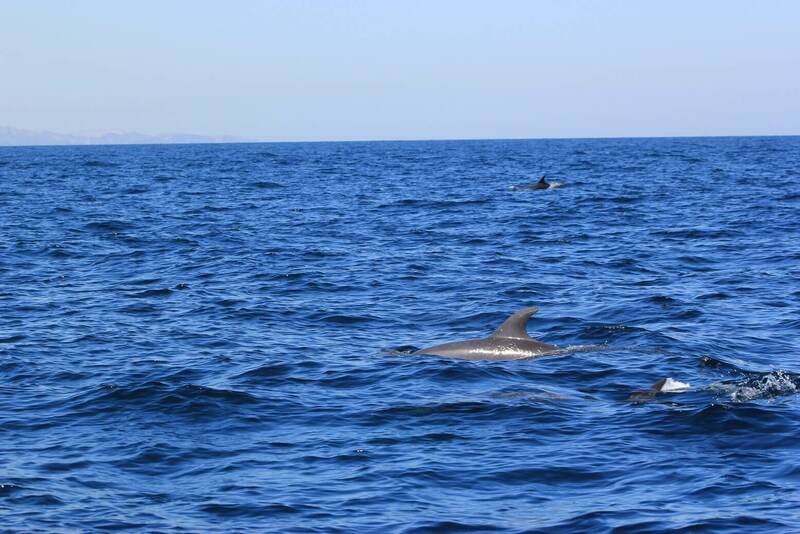 In addition to viewing the rugged coast, you can sail a few miles out to see the dolphins or whales who travel the coastline. 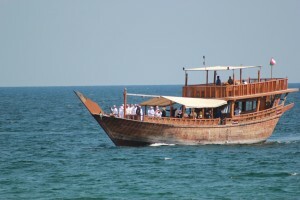 You can hire a traditional dhow, a sailboat, or a speed boat to take you dolphin watching. 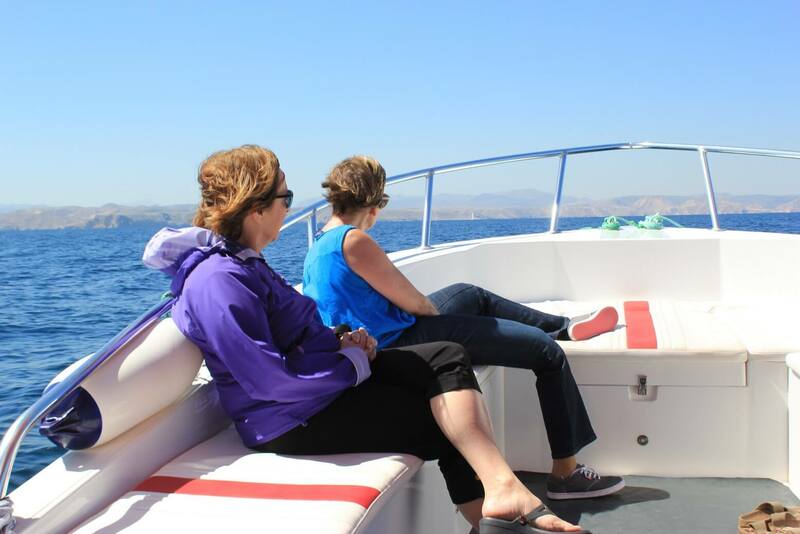 We paid about $45 per person for a 2.5-hour tour in this speedboat. As we returned to the marina we noticed the country gearing up for the 2016 America’s Cup, the world’s oldest international competition. On Sunday, the Brits’ catamaran finished first and America’s Team, sponsored as usual by Larry Ellison and Oracle, finished second. Learn more from this youtube video. Elegant resorts are tucked into secluded coves. 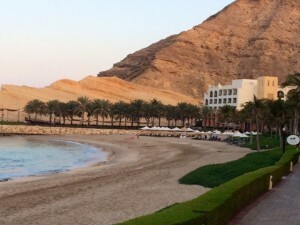 If you want to spend your holiday in the lap of luxury, check into one of Muscat’s exquisite beachfront hotels. I love to visit hotels, if only for a drink or a meal, just to experience the ambience in case I ever need a setting for one of my novels. 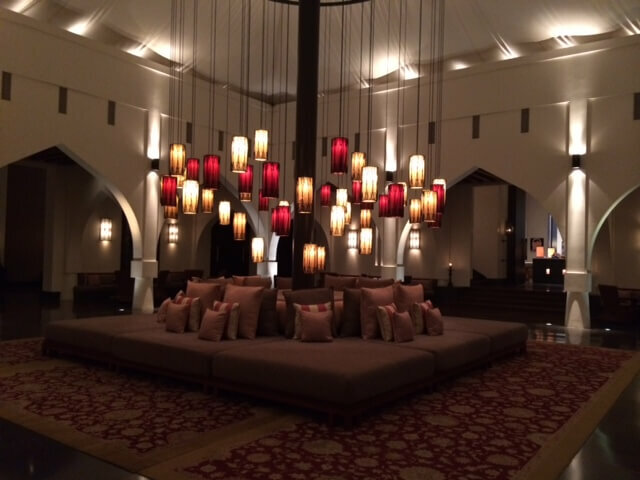 I was struck by the allure of the lobby in the elegant Chedi Hotel, created by its traditional Omani architecture. Yet from the lobby through the bar to the pool I could also feel the Chedi’s peaceful zen-like vibe. 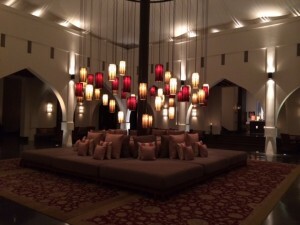 Once the Sultan’s palace, the Al Bustan Palace is now a five-star hotel. 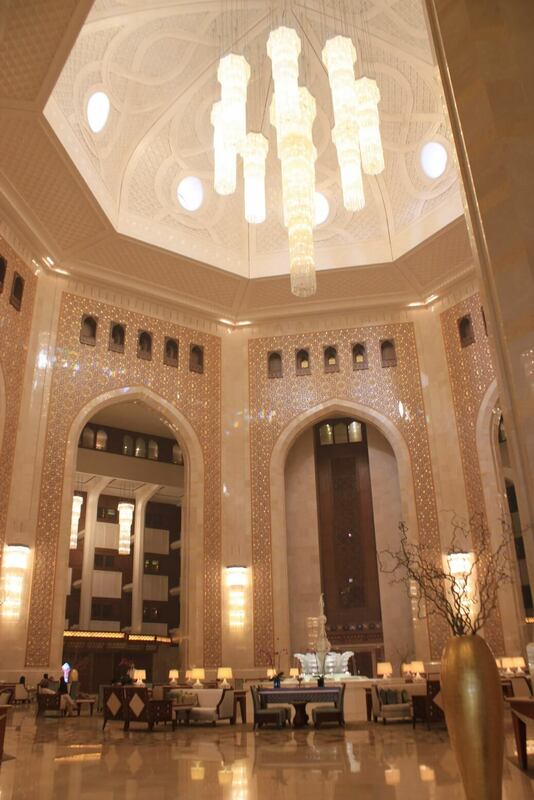 With frankincense burning in every corner of the lobby, you enter to a hazy atmosphere, which smells and feels like old Oman. 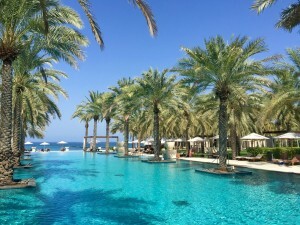 Yet outside, the property along the ocean feels like modern-day luxury as you walk through the grassy area and the beautiful, palm tree-lined infinity pool. The Shangri-La, where we stayed, offers three distinct properties. 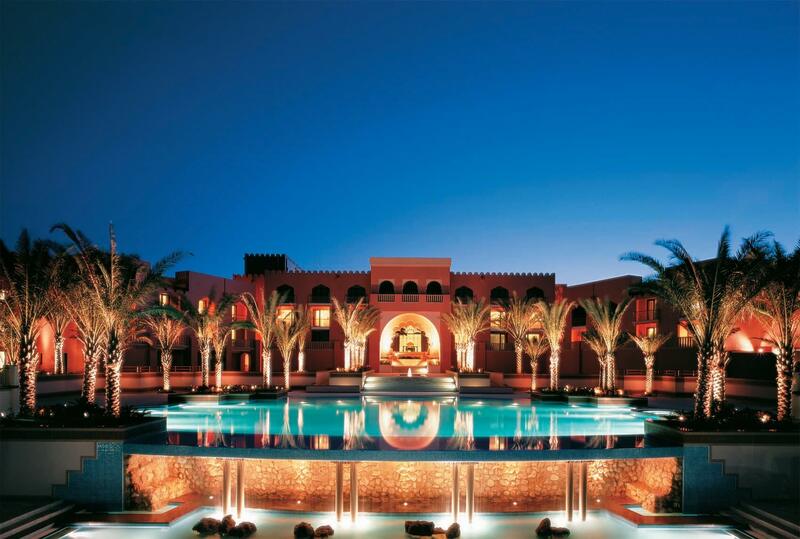 On top of a peak stands the very exclusive Al Husn (the fort) Hotel, with gorgeous Arabian architecture and adult amenities. During happy hour in the courtyard, drinks and hors d’oeurves are complimentary while you listen to a young woman plucking a harp under the stars. 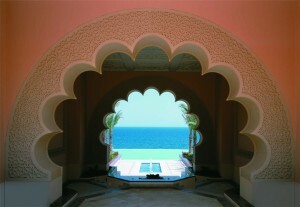 The view at the open end of the courtyard is through this arch to the pool and the sea. The other two properties cater more to families with kids. 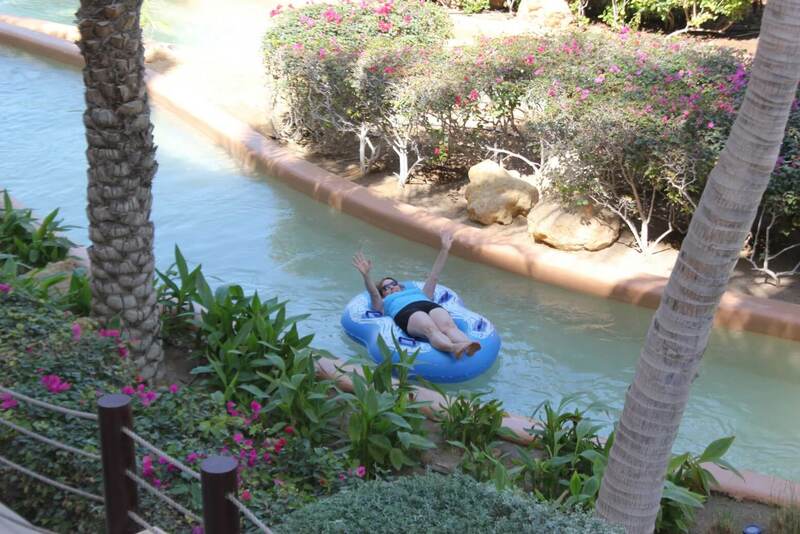 But I’m writing as one big kid, who couldn’t resist traveling the lazy river, which links the hotels. Muscat has a range of hotel prices, and if you don’t want to go five-star, you can stay in town, like we did in 2007. The Radisson has great food and a lovely property. For a private beach experience you can purchase a day pass at the five-stars for around $50 US, which includes a large buffet lunch and access to all the facilities. Note that hotel prices are quoted in Rials, which equal 2.5 to $1. 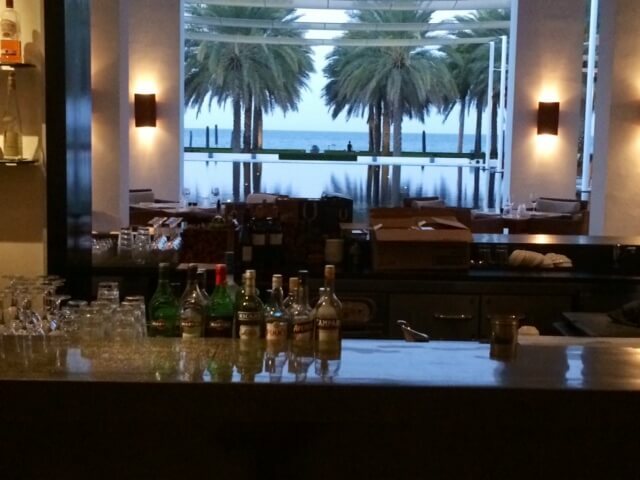 There’s nothing like finishing the day—or the trip—with a sunset dinner at the beach. At the Crowne Plaza, my family and I enjoyed steak or hamour, a delicious thick white fish common to this bay. 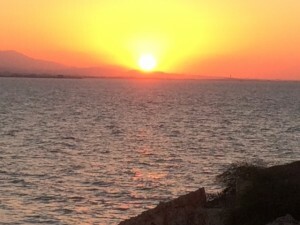 Our focus crossed the bay to the mountains to the glorious sunset, a view which inspired us to count our blessings for a beautiful trip and a loving family, who showed us how to enjoy Oman. Even wonderful leaders like Sultan Qaboos don’t live forever. As we were leaving Oman, he was traveling to Germany for cancer treatment. And since he has no heir, it’s hard to say what will result when he eventually passes. In addition, the Omanis know that their oil reserve is limited, so they are scrambling to build their tourism industry. 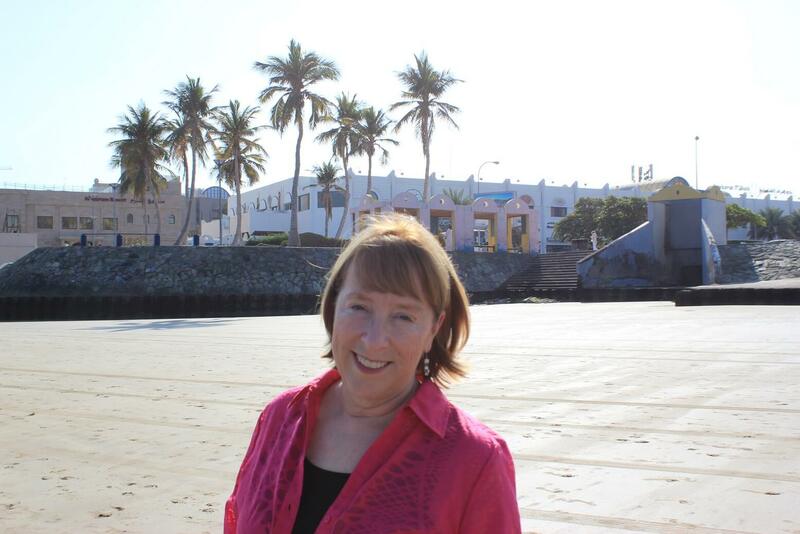 Right now the oil/tourism partnership succeeds. But when the oil is gone, who knows. 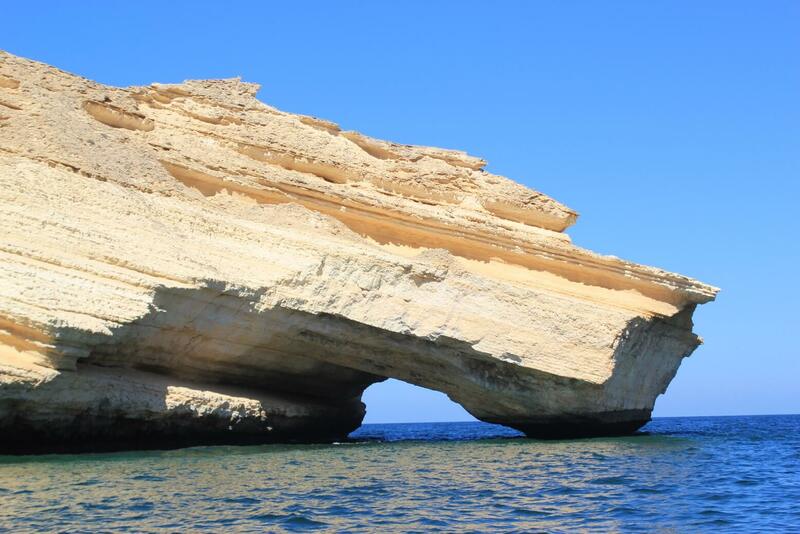 So visit Oman now while it enjoys this golden age of peace and stability. Comments are awesome. If you don’t see a box below, the link is under the title. Al Husn Hotel photos, courtesy of the Shangri-La Hotel Press Kit. Wonderful pictures and article Nancy. 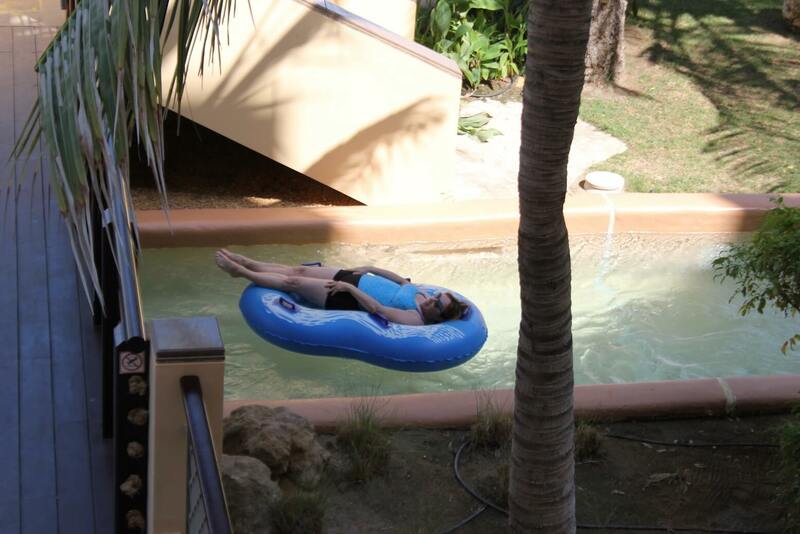 Wish I was floating down the lazy river right now. Things have changed but it sounds like the Omanis are the same lovely people. Sad to hear about Sultan Qaboos. I hope he lives a lot longer but has also thought carefully about his successor. Looks very inviting. We’ll have to put it on our list. This is a very interesting blog by my favorite travel writer, who also happens to be my beloved wife. 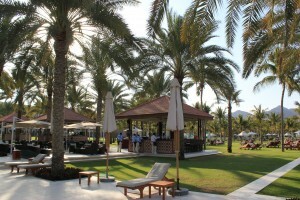 Reading her descriptions and seeing the photos makes me want to return to Oman, although we were just there in February!